Why Buy A House When You Can Buy A Hotel? Where would you be if you walked 600 feet from your house? If I walk 600 feet out my front door, I have to avoid a broken sewer pipe and some noisy roadwork. What do you see when you walk 600 feet out your front door? 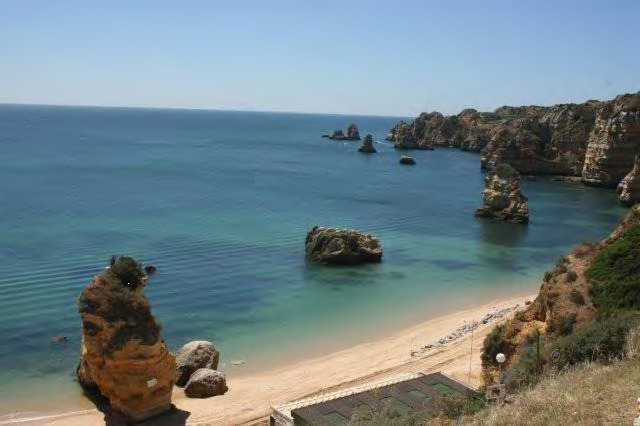 When Lagos hotel-suite owners walk 600 feet out their front door, they are greeted by the Dona Ana Beach, the most photographed beach in Portugal due to its breathtaking beauty. If they walk 600 feet in a slightly different direction, they marvel at Portuguese buildings from the 1400s and a history that goes pre-Roman. On lazy days though, Lagos’ hotel-suite owners can saunter only 200 feet from their front door. After shuffling just 200 feet, they see their rooftop restaurant and pool, their spa and health club, their Zen garden, their executive lounge, their other restaurant, their kids’ club facilities, their other pool, about 3,000 hours of annual sunshine, and their parking lot. I added that so my friend in Panama doesn’t feel too bad. Incidentally, they don’t see the neighbor with the many health issues. For 149,000 euros (US$175,300), these Lagos folks now own a hotel suite. These hotel suites earn a guaranteed 7% return every year for 15 years, and can be part of an application for Portugal’s Golden Visa (more on the visa later). Freehold ownership underpinned by bank guarantee during the construction phase. The guaranteed rental profit comes into fruition in March 2020, when the project enters operation. However, you do not have to wait to make money. Until March 2020, the developer will pay 3% annually. Furthermore, the guaranteed return of 7% as of March 2020 is based on a conservative occupancy rate of 70%. If occupancy increases, which it probably will because Lagos is one of the Old World’s leading beach destinations, returns will increase to a maximum of 10%. With the waiver of condominium and maintenance fees for 15 years, you can sell before the 15 years are up or stay in, but understand that overheads will go up. This is a long-term, high-yield opportunity with an experienced Portuguese developer, in one of Portugal’s most desirable locations. 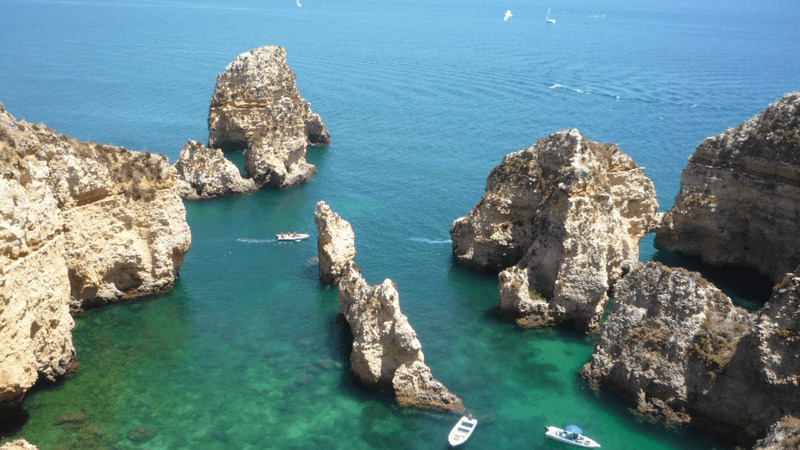 The Algarve is at the southern tip of Portugal and offers a wide range of tourist attractions, making the area appealing for national and international visitors. Marry this with the locals’ excellent hospitality and the Algarve’s unsurpassable climate, and you’ve got yourself a formidable holiday destination and an attractive addition to your property portfolio. Lagos is a historic town with a strong maritime culture, marina, spectacular beach, superb weather, and great restaurants. It has plenty to do, including the local zoo, cruises and water tours, outdoor activities, 10 museums, and many buildings of historical interest. Lagos is also a member of Cittaslow, a global organization that advocates the Slow Movement. This means Lagos takes a laid-back approach to life, employing urban policies that encourage controlled and slow traffic, “real” food and not fast food, and a meaningful lifestyle. This investment makes sense not only because of its high return and spectacular beach but because Portugal is the easiest place in Europe for non-residents to get a mortgage. This country is open for business and attracting a lot of foreign investors thanks to its Golden Visa program and its Non-Habitual Resident (NHR) tax benefits. Banks in Portugal will lend to non-residents for up to 30 years (or until age 75) and offer up to 80% LTV in some cases. Current interest rates are about 2.5%, depending on the length of the mortgage and whether the rate is fixed or variable. With the U.S. dollar strong against the euro (at time of writing, US$1.18 to 1 euro), now is the right time to buy with Greenbacks. You can get a local mortgage and hedge against the possibility of the euro going up by negotiating the term of the loan. Portugal offers both the Non-Habitual Residents program and the Golden Visa. As discussed at the Live and Invest Portugal Conference earlier this year, Portugal’s Golden Visa offers residency-through-real-estate. The minimum investment is 500,000 euros, cash. The investment can be in one or more properties and the property can cost more than 500,000 euros but the cash part must constitute half a million euros. The 500,000 euros minimum investment is reduced to 350,000 euros if the property is more than 30 years old. There is also a discount if the property is in a low population density area but unfortunately, Lagos does not qualify. It doesn’t have a high population density but it falls just short of the low population threshold. The Golden Visa grants residency to you and your immediate family and can be renewed every two years providing you and your family spend two weeks in the country every two years. The Golden Visa program allows you to travel freely throughout the EU Schengen zone. After obtaining residency, you can apply for citizenship and a second passport, which would give you the right to live, work, and study anywhere in the European Union. And the icing on the cake is that Portugal has recently sped up application times, as I have written in a recent issue of Global Property Advisor. Live and Invest Overseas’ preferred attorney in Portugal advises on all immigration issues and our sister publication Simon Letter, extensively covers going offshore and various residency programs across the world. You can get in touch with this hotel-suite developer here. Samantha Russell is the Editor for our Global Property Advisor, guiding readers to establish, build, and diversify their international property portfolio, and is LIOS’ in-house real estate Guru, protégé to Lief Simon. Samantha started following property markets when she was 21 and made her first investment just two years later at 23. After getting to grips with her local market (London), she began to look farther afield at international markets. Armed with this firsthand experience, Sam knows what to look out for when considering a real estate deal, but she also backs it up with serious due diligence on every project she considers for her readers. As she says, “you can’t fall victim to PDF fear,” meaning she happily ploughs through 200-page PDFs on property or planning law… sometimes in her second language. Currently living in Panama but having traveled three continents, Samantha has seen a bit of everything in life. She goes off-road and nips through cities, submerging herself into society´s truths and secrets. These days, nothing gets past her unnoticed… she then puts pen to paper and divulges all, bringing her readers the sweet, and at times bitter, truth. Known for her honest writing, Samantha covers property markets throughout Europe, the Americas, and Asia. She also dives into the world of citizenship through investment programs, current affairs, Smart Cities, and the potential of blockchain.